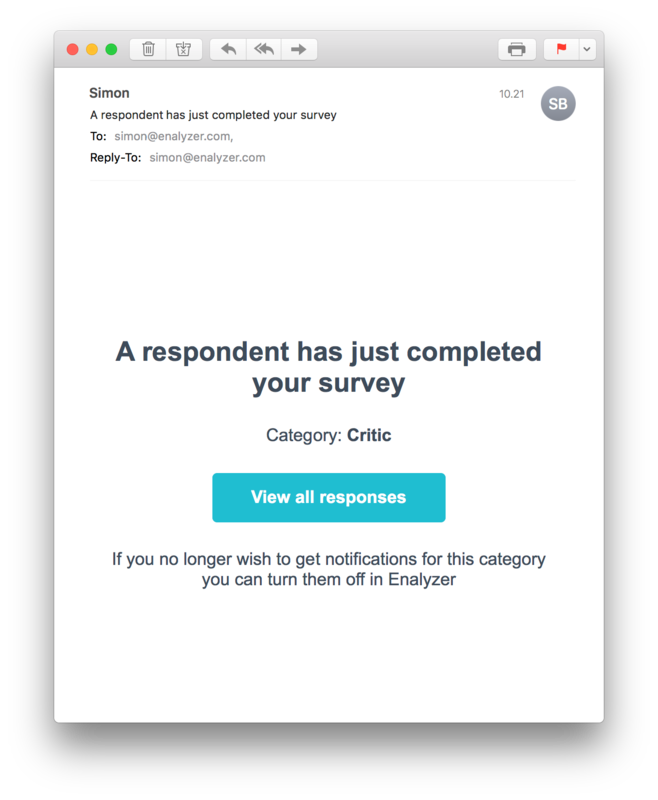 With Enalyzer’s categories and notifications, you can tag responses and receive email notifications when incoming responses match your criteria. 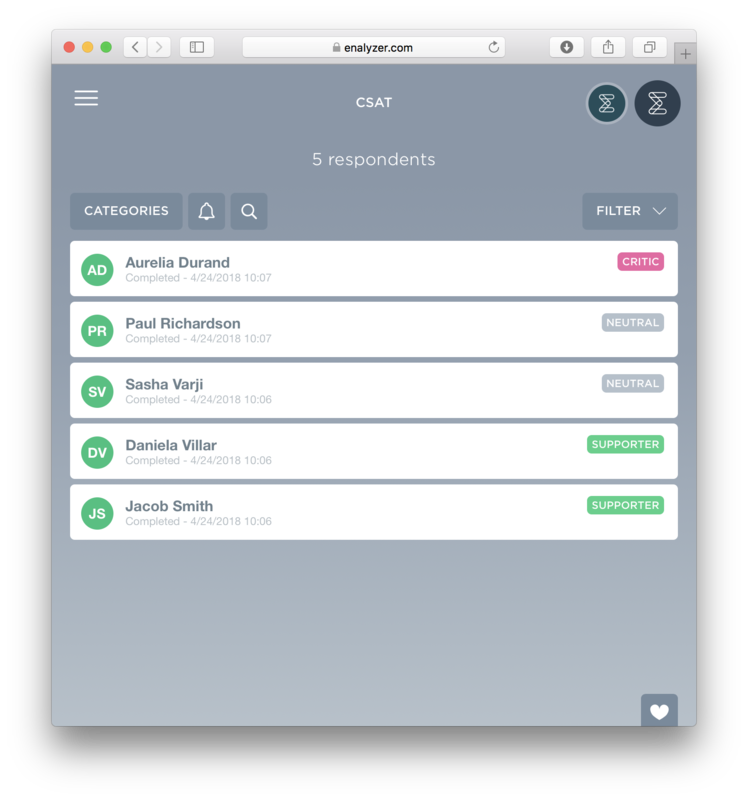 This way, you can stay on top of incoming responses and react to them immediately. Does this sound useful but abstract? Well, it doesn’t have to be. To help you make better decisions, we’ve compiled 3 useful examples that you can use as inspiration. Once you’ve done that, depending on your chosen scale, you can categorize your respondents into supporters, neutrals, and critics. You can activate notifications for the supporter and critic categories and be alerted on the incoming responses that match this criteria. 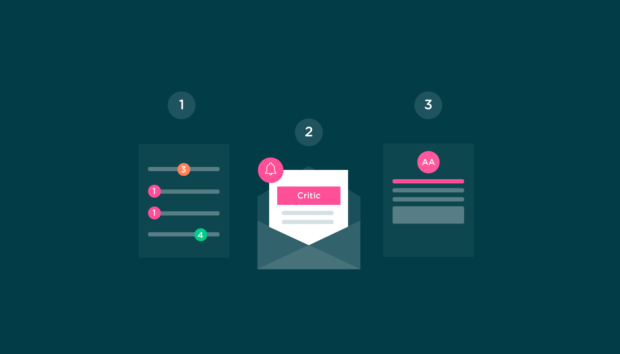 In other words, from then on, you’ll get email notifications whenever a customer is satisfied or dissatisfied with your service/product and contact them instantly. When employees spend their own hard earned cash on business-related expenses, they have to be reimbursed. Didn’t you know that? Awkward… Anyway, this can include business travels, lunches and/or transport. Many companies have an Excel template that employees have to use every time they need to be reimbursed, however, with Enalyzer you can make this easier for everyone involved. As the HR responsible, set up a reimbursement survey where you ask about the type of expense, employee details and an expense amount. Once you’ve done this, set up a category based on the expense type to keep a tidy overview. Enable email notifications and you’ll know when someone needs to be reimbursed. No more Excel. You’re welcome. You are planning an event, for example, your birthday and you’d like to know who is coming and if they’re bringing +1s, so you naturally set up a quick survey to handle the RSVPs. Divide your guests into three categories, those that are attending, those bringing +1s and those who are not attending. Once you’ve done that, you can enable email notifications on all or some of the categories and keep up with your growing guest list! → Create a FREE account and start using categories and notifications!